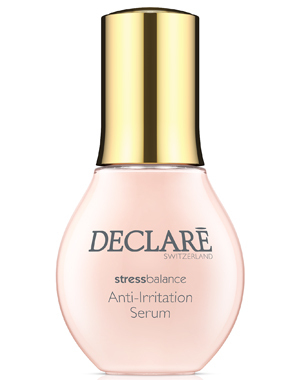 This sumptuous serum, with the unique Declaré src-complex™, is an extremely effective skin-care supplement for stressed, irritated or sensitive skin. 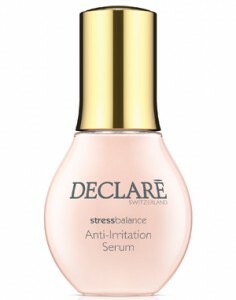 It’s the unique combination of valuable active ingredients that makes this ultra-light serum so effective: signs of stress, fatigue and rashes are visibly reduced, and your complexion looks smooth and relaxed, radiating a wonderful freshness. Thanks to the addition of hyaluronic acid and moisturising complexes, the skin is plumped out, making wrinkles and areas of loose skin less visible. At the same time, highly effective plant extracts reinforce the skin’s own protective function, helping your skin to combat daily stress factors. For perfectly groomed and fortified skin, and a relaxed and fresh complexion. Use mornings / evenings after cleansing. Apply under your customary skin care product. For daily use, or as a course of treatment. Twist the cap anti-clockwise (approx. ½ turn), the drop mechanism will rise to the top and the pipette will fill with the serum. Continue to twist the cap anti-clockwise to open the bottle. The serum is squeezed out of the pipette by applying pressure to the lid.